Collectively, Indigenous peoples include less than five percent of the world’s population, but, at the same time, make up more than 15 percent of the globe’s poorest individuals. 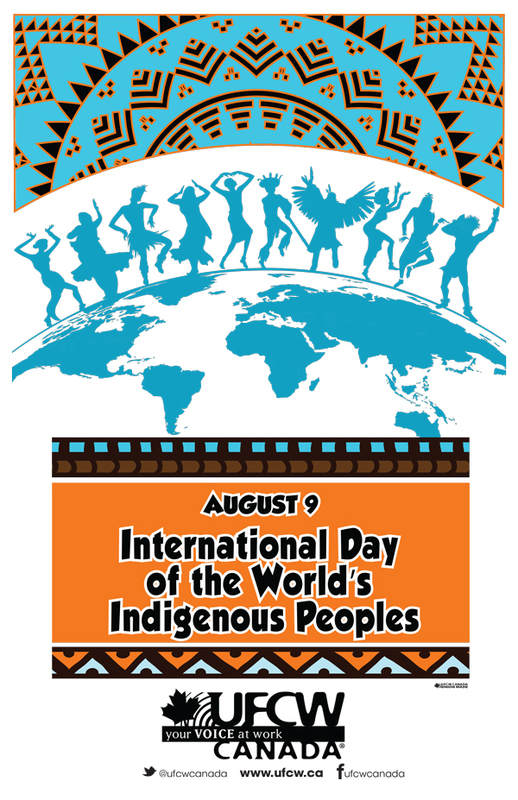 August 9th honours the existence of Indigenous peoples and their right to live free from discrimination, and to hold equal rights, with self-determination as an underlying principle. The day also honours the rich history that has been carried through generations of Indigenous peoples and the importance of living in harmony with the land. Last year marked the tenth anniversary of the United Nations Declaration on the Rights of Indigenous Peoples (UNDRIP). As the most comprehensive international document that exists in this area of justice, it outlines the framework of minimum standards that need to be met for the well-being of Indigenous peoples around the globe. While the development of UNDRIP goes back more than two decades, the Government of Canada only signed the agreement in May 2016. As such, UFCW has joined other civil society organizations in ensuring that the federal government is staying true to the commitment detailed by UNDRIP. We are also lobbying the government to fully support programs that expand services to First Nations communities across the country, so that our Indigenous Brothers and Sisters will have access to the same services as all Canadians. In 2017, the federal government released ten guiding principles regarding Canada’s relationship with Indigenous peoples. Yet, the National Inquiry for Missing and Murdered Indigenous Women and Girls continues to encounter alleged government interference, and is taking twice as long as originally projected. On the International Day of Indigenous Peoples, UFCW Canada joins its Indigenous Brothers and Sisters in calling on the federal government to enhance its efforts, and to work directly with First Nations, Metis and Inuit in advancing the overall goal of reconciliation. This August, please take a moment to support the UFCW Canada campaign to End Discrimination Against First Nations Children. and the Indigenous Inclusive Language and Collective Bargaining Agreements resource, in collaboration with the UFCW Canada National Council Indigenous Sub-Committee.